I wanted to show one last Christmas item before it got packed away. Every year for our International Christmas Dinner, I buy 2 Christmas ornaments made in whatever country our dinner is going to be that year. One ornament is for us and the other is for my parents. This is the ornament I got this year made in Italy. 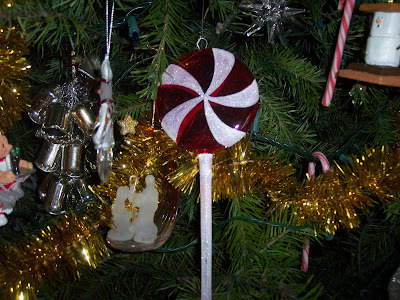 It is a large lollipop! So fun. It is very delicate, made of glass. Okay, that is it. The last of Christmas 2009 holiday decor. In the words of our two year old, "Everything has hopped away". When anything in our home is no longer where it was, she thinks it hopped away. I love your little ones words.. 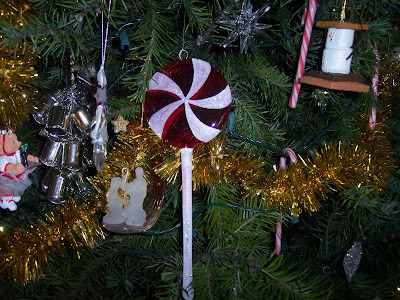 I love your lollipop ornament, and how your family has the International Christmas Dinner! I wish Christmas would hop away over here! I keep finding things that I forgot to pack away, and there's still all the stuff outside. The cords are frozen to the ground, and we're expecting 6-10" of snow tomorrow. That's ok, I didn't feel like putting it all away anyway! How cute, like someone else said; I could look at christmas stuff all the time. Just love it. Very pretty ornament! Let's see what your dd says after Easter!